A few days ago, my family was in the mood for a good old burgers-and-“fries” meal. Now, you know I try to eat as little processed food as possible, so rather than reach for a frozen Boca or Garden burger, I opted to make a bean-based burger from scratch. And though these are not as fast as a microwaved burger from a box would be (what is? 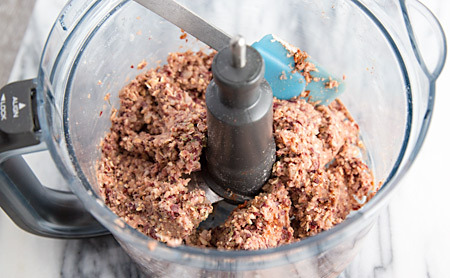 ), they’re really easy to mix together in the food processor and they cook in about 25 minutes. While they’re in the oven, you’ll have time to assemble your condiments and slice and chop any vegetables you want on your burger. 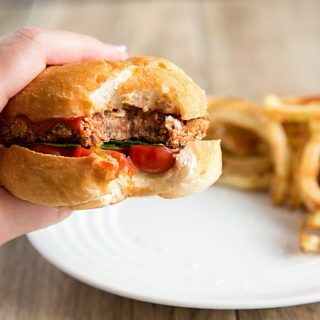 I ate my burger without a bun with spinach, red cabbage, and tomato, but these zesty veggie burgers also taste great on a bun with ketchup and all the usual fixin’s. Since I created this recipe 10 years ago, I’ve made it over and over again for family and friends. Recently, I bought an air fryer and decided to try using it to make these burgers. The results were delicious, crispy on the outside and moist and tender on the inside. I’ve updated the recipe to include the air fryer directions, which you will find in the notes section. To make the oil-free fries in the photo, I used the French fry disk on my Breville Sous Chef food processor to cut thin fries. Then I tossed them with a tablespoon of aquafaba (chickpea cooking liquid) and creole seasonings. I preheated the air fryer to 360F and cooked them for about 15 minutes, rearranging them once about halfway through. They are best eaten right away. These bean and grain-based burgers may not taste like meat, but they’re a delicious meal in their own right. Use as much or as little chipotle peppers as you like; the flavor can be a subtle smokiness or a raging inferno! Bake for about 15 minutes. When the bottoms are lightly browned and beginning to get crisp, turn the burgers and cook for 10-15 more minutes, until the other side is brown. Do not overcook or they will be tough! Serve immediately with accompaniments as desired. These keep well in the fridge and can be reheated for a quick lunch. Preheat air fryer to 390F. Form burgers on parchment paper and transfer to air fryer (I put them directly into the AF but they did stick; if possible, cut parchment paper to fit AF.) Cook for 8 minutes. Turn burgers over and rearrange from top to bottom if you are using a rack. Cook 4-8 more minutes, until burgers are crispy outside and firm. Be careful not to overcook or they will be hard. Success! Both my kids ate the whole thing! I loved these. I have one other recipe I like from Chloe of Chloe’s Kitchen, but this was easier and held together so nicely. These are delicious and will now go into my regular rotation! We didn’t have chipoltes, but used some canned ancho chilies we had and added a little cayenne. 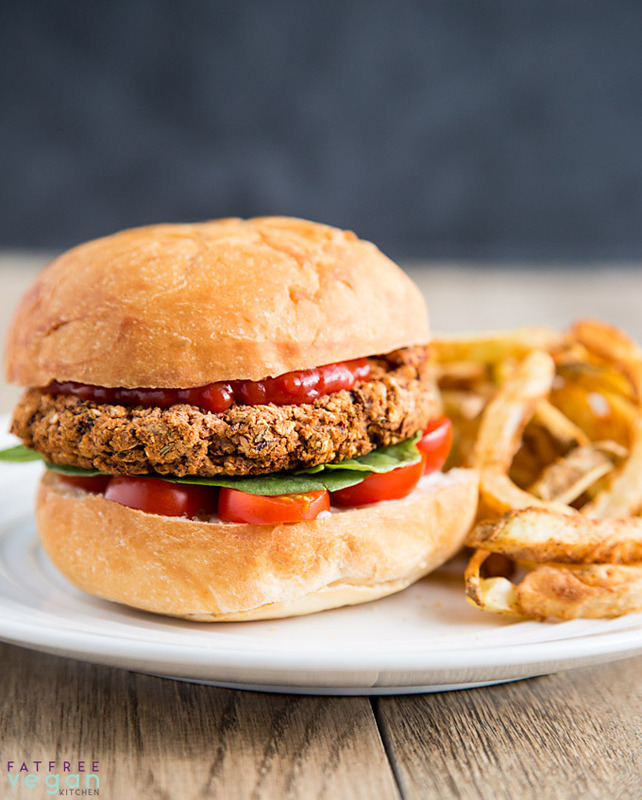 I searched a delicious vegan burger and am so glad to have found this! Very allergy-friendly and so simple to make. A double batch of these are baking in my oven right now, the third time I’ve made these over the last month. Thank you!! I really enjoyed this recipe, and will definitely be making it in the future! I think the only thing I would change is it make it a bit spicier next time. I’m starting a 6 month attempt at controlling my cholesterol with food choices and exercise. I don’t want to take a Statin unless absolutely necessary. I’ve never tried Veggie Burgers, but, I’m willing to try most anything to keep from taking the medicine. Thank you for the yummy recipes! I don’t have a food processor. Would it be better to hand mash or try to pulse on low setting in my Vitamix? I think chopping the vegetables and mashing the beans by hand would be best. ohh I can’t wait to try this! 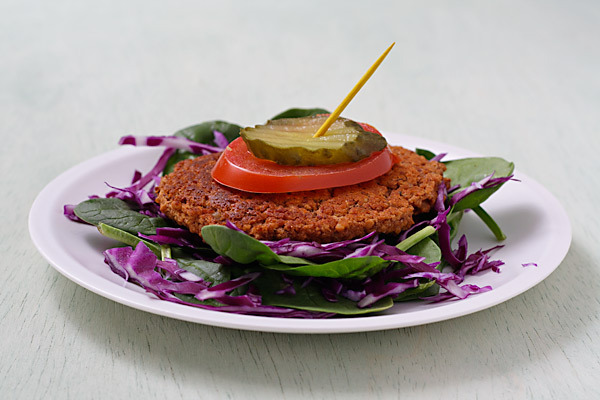 I love bean burgers, and I would try this exactly how you have pictured. Thanks Susan! I have all ingredients with me except quick oats. can I use cooked/uncooked steel cut oats?? Or any other common substitutes? Thank you for awesome recipes. I’m already sure it’s going to be great! Yum! Used quinoa instead of rice and because I did not have any chipotles I used chipotle chili powder. Easy to make and definitely will again. 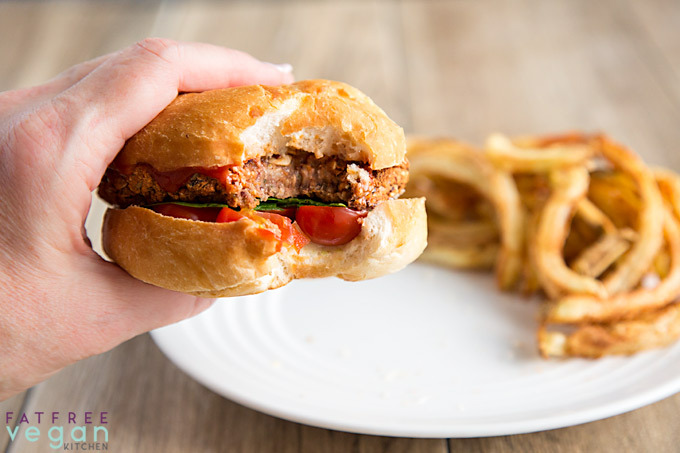 How do you make a bean burger that isn’t gooey on the inside? My family won’t eat them. This one isn’t gooey; would call it moist. If I cooked it longer, it would lose the moistness but be dry. For a burger that is firm and lacks any kind of gooieness, I would look for a recipe that uses wheat gluten. Susan, These look so good! Getting the ingredients today. Can’t wait to make them. I hope you enjoy them, Susan! What are homestyle oats? I use the old fashioned oats. Is the pat the same. Do quick,oats work better? Homestyle is the same as old fashioned. Sorry for the confusion. That’s what I used and they work perfectly.